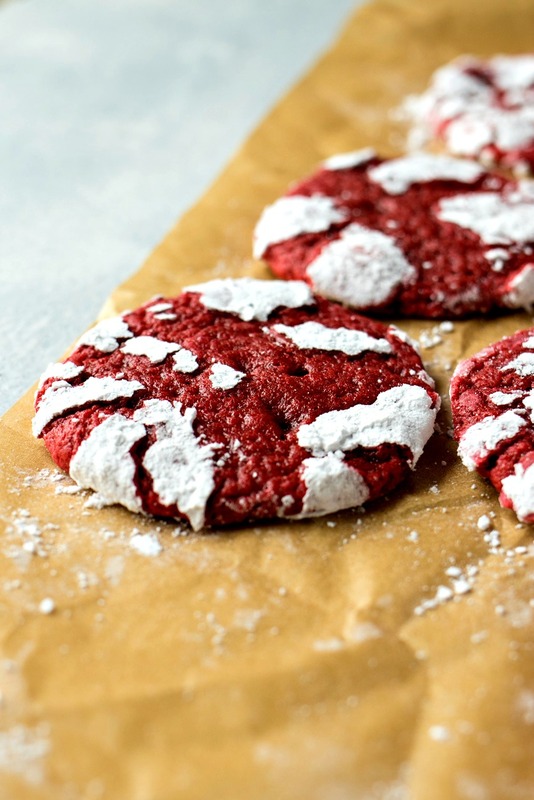 Red Velvet Crinkle Cookies – Red velvet cookie dough is rolled in powdered sugar before they’re baked into chewy cookies, forming white crinkles on top. Christmas may be past us (sadface), but that doesn’t mean I’m done making cookies. 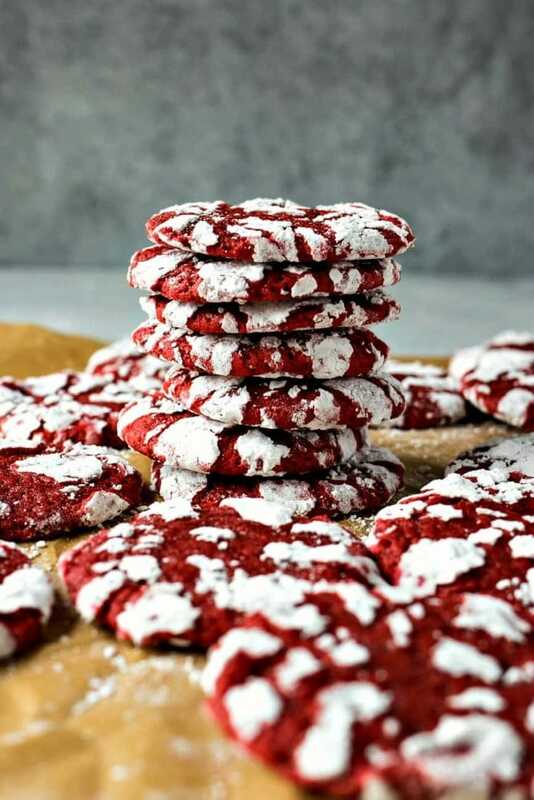 Diet doesn’t start until Jan 1, so you better believe I’ll continue my baking right up until that day and I’m starting with these Red Velvet Crinkle Cookies! So far this month, I’ve made these raspberry almond linzer cookies and these classic peanut butter blossoms. Very different cookies but both are my favorites, especially this time of year. 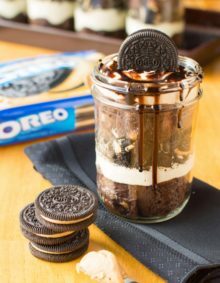 Today, I want to share a cookie, which is also very different from the above, but not so different from a cookie I featured last year on the blog. 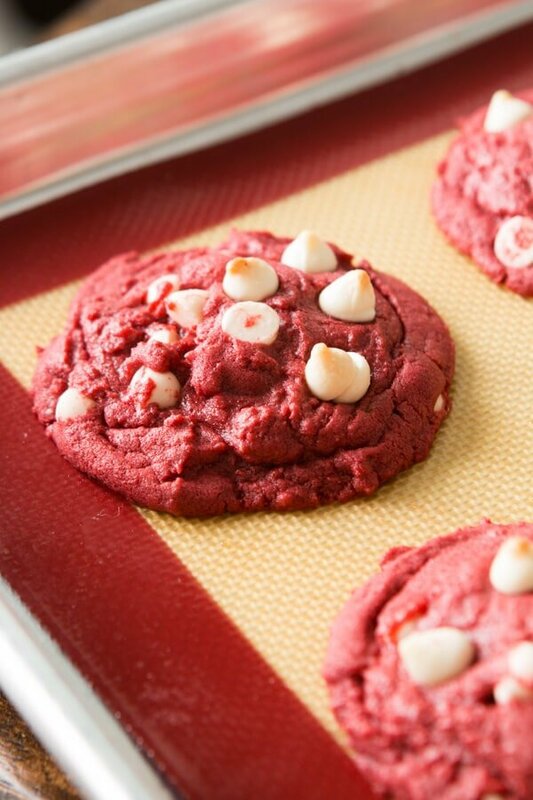 Well, today’s cookie is just like it, except the chocolate is taken wayyyy down and the dough is colored red. 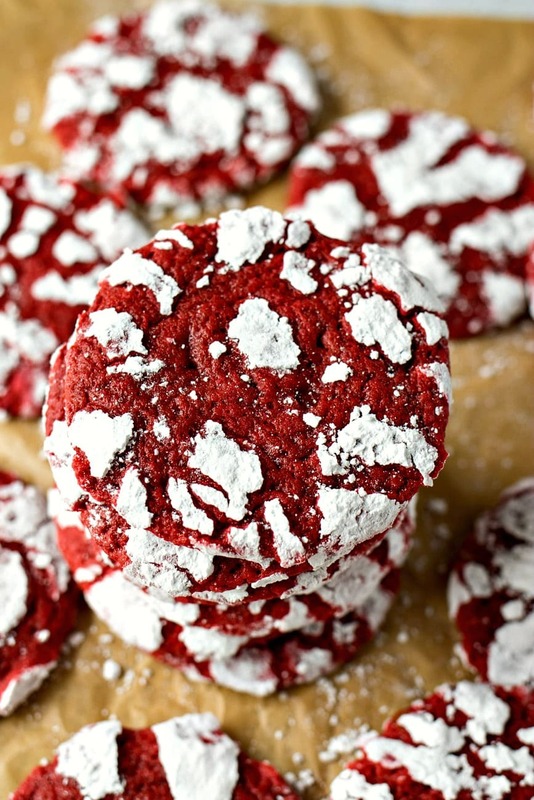 Say hello to my Red Velvet Crinkle Cookies! These cookies are chewy little drops of heaven. With just a hint of cocoa, they’re not super rich, which means I can easily inhale a dozen before even know what happened. In other words, they’re dangerously good. 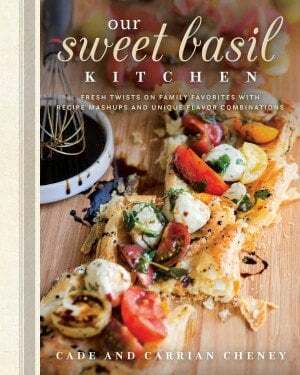 To make them, the recipe is not much different than any other brown sugar cookie recipe. 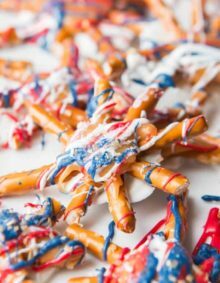 The biggest differences are the addition of red food gel and rolling the chilled dough in powdered sugar before baking. Speaking of the powdered sugar, this is the most important step in the whole process. If you don’t coat the dough properly, it will absorb the sugar and you won’t get those gorgeous crinkles on top. The key for how to make crinkle cookies is rolling it in the sugar TWICE so you can’t see a smidgen of the dough though the sugar. You’re gonna love how chewy these cookies are. Good luck eating just one! 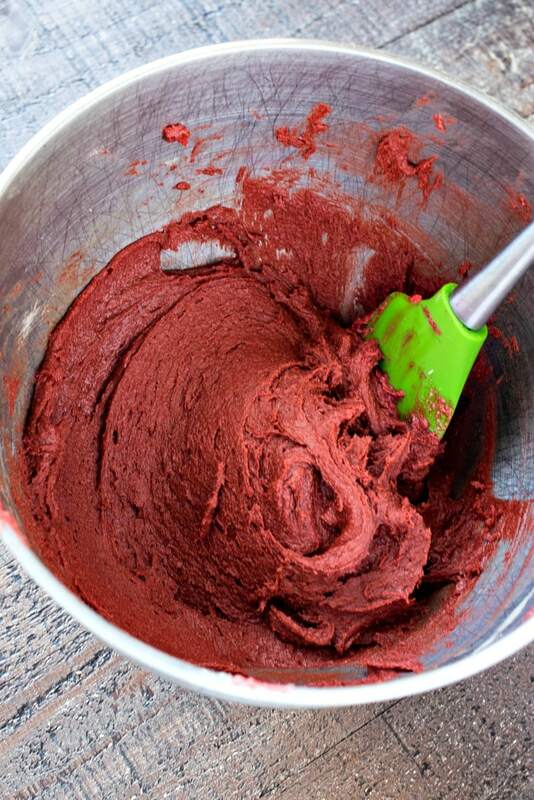 Add flour, cocoa powder, baking powder, and salt together in a bowl. Whisk together to combine. Set aside. Add softened butter and sugars to the bowl of stand mixer and beat with a paddle attachment until fluffy, about 2 minutes. Add eggs, one at a time, and beat on low until combined. Add vanilla and red food coloring gel and mix on low until combined. Scrape down the sides of the bowl to help the mixture combine completely. Add flour mixture and mix on low until dough forms, about 30 seconds. Grab a medium baking sheet and line with a baking mat or parchment paper. 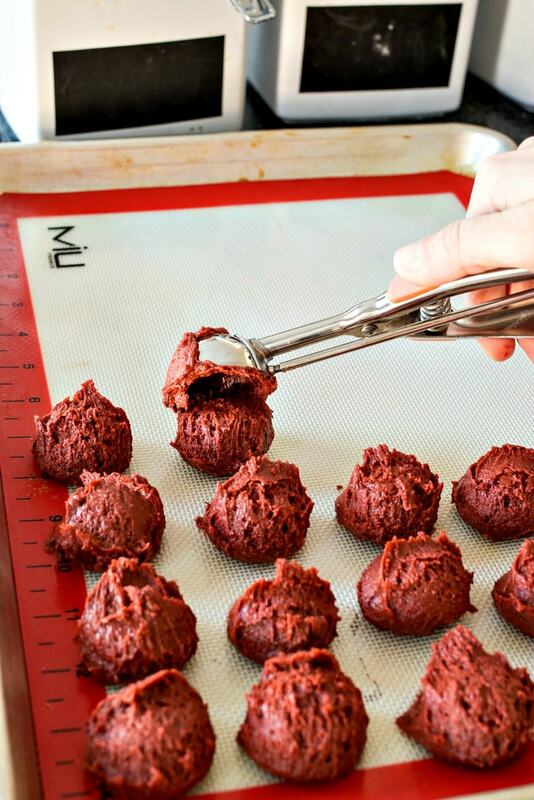 Scoop cookie dough into 1 1/2 tablespoon-sized dollops and place on baking sheet. It's okay if they're not pretty; we'll smooth them up once they're chilled. Chill dough balls until firm, about 2 hours. Once the dough is firm, remove dough from fridge and preheat oven to 350 degrees. Prepare two baking sheets by lining with a baking mat or parchment paper. Roll dough balls so that they're perfectly smooth. Place powdered sugar into bowl. Roll dough into powdered sugar really well until completely covered in sugar. Place onto prepared baking sheet about 2 inches apart. Repeat with the remaining dough. Bake cookies for 9-11 minutes, until the edges crisp. Remove from oven and cool on baking sheet for 7 minutes before transferring to wire rack to finish cooling. 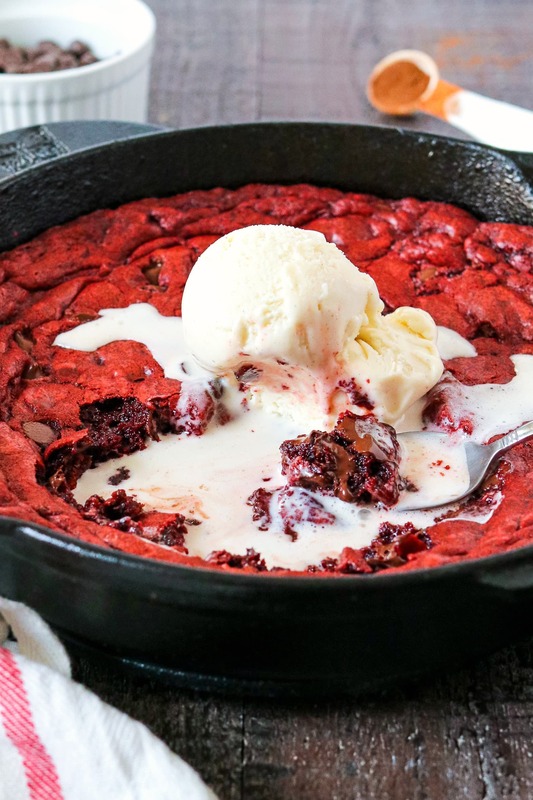 Can you even believe how awesome this red velvet skillet cookie looks?! 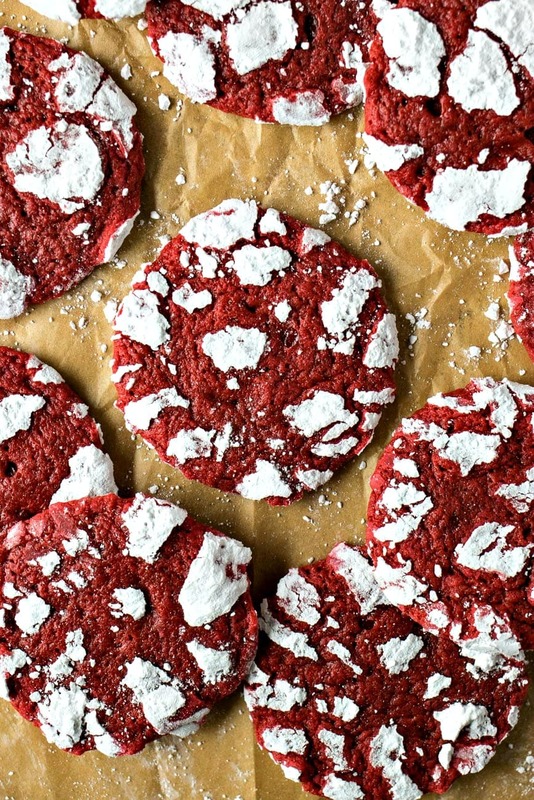 Just looking at these red velvet white chocolate chip cookies makes me hungry! 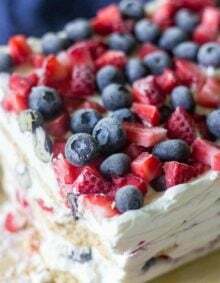 Have you done this with red velvet emulsion?